Take a break from regular cornbread and try this fluffy Cheddar and Zucchini Cornbread recipe. 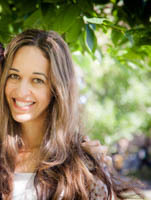 Trust me, it is the best cornbread recipe ever! The batter can be whipped up within minutes and once baked, this cheesy cornbread is the perfect accompaniment to any bbq, soup or stew! If you’ve tried many cornbread recipes and are still looking for the perfect one—here’s the best cornbread recipe I know! Cheddar zucchini cornbread recipe! 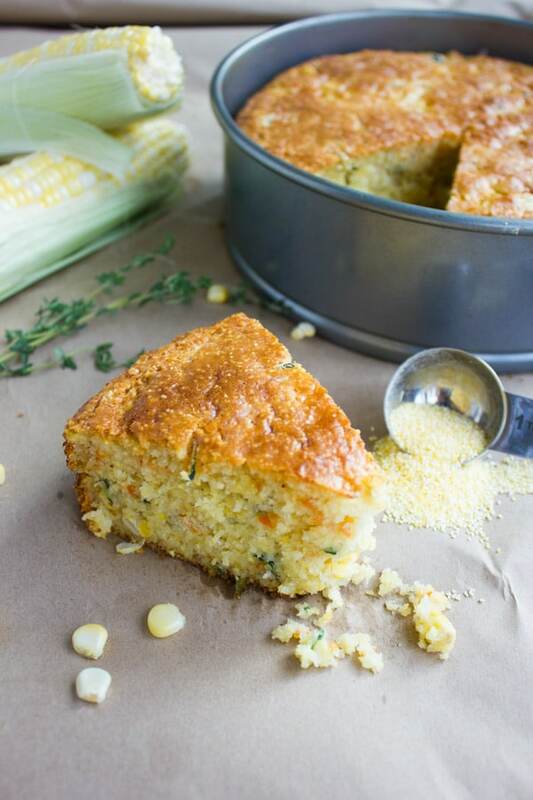 A cornbread that’s tender, fluffy, loaded with corn and super moist from the zucchini. Cheddar cheese adds more tang and cheesy-ness to the bread which is totally optional, but so worth it! 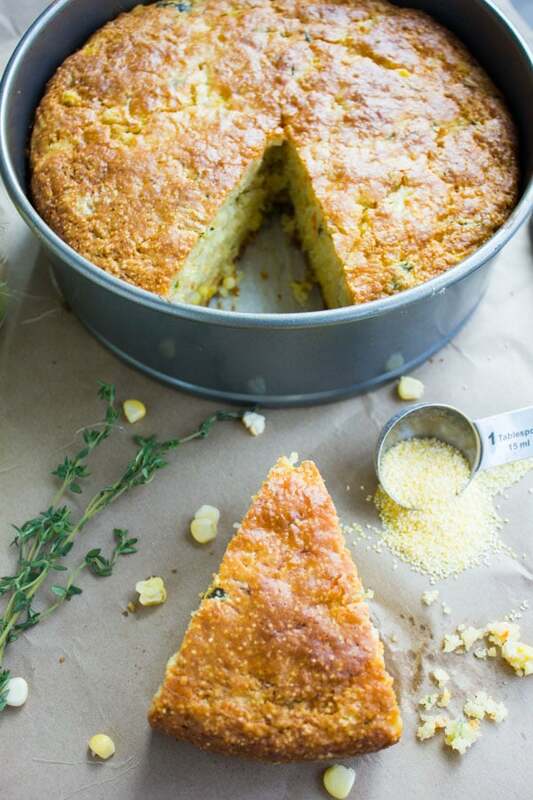 One bowl and one whisk is all the tools you’ll need to make this best cornbread recipe today! I love cornbread. Back when I just got married, I moved to Miami FL. I loved it. Cornbread wasn’t a big thing in Miami —and yet I tasted the best cornbread ever at a local breakfast joint in Miami Beach! Ever since then, I changed my perception of a good cornbread and I made plenty of versions to reach up to this one! I know classically in the US cornbread is chilli’s best friend! And I find it to be a perfect side to soups—any soup, and salads. I also love it toasted slightly with a dab of butter or cream cheese or just plain tender fluffy bread on its own. As a bonus, my little ones seem to agree that this is indeed the best cornbread recipe!! Despite being loaded up with zucchini and grated carrots! Lucky for me, there’s PLENTY of corn to cover it up! 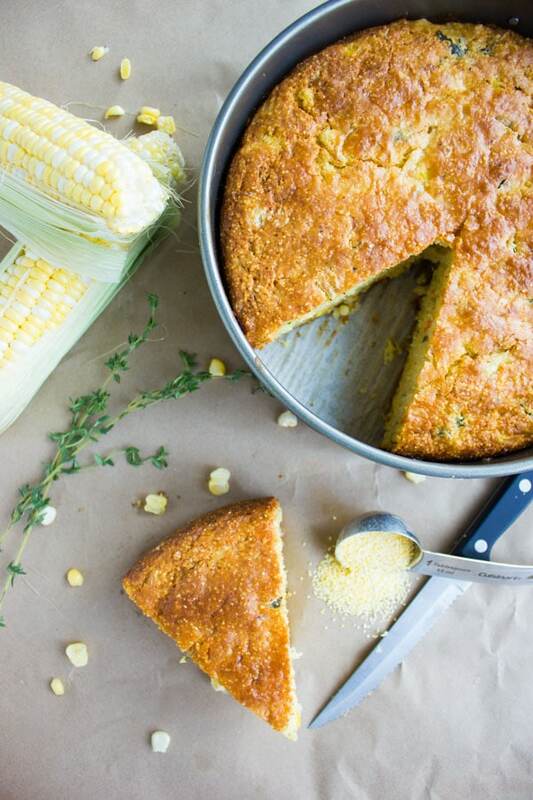 What makes this the absolute BEST cornbread recipe, you ask? Let me tell you, it all starts with the right texture. This cornbread is fluffy, not dense, light—not oily, and moist as opposed to dry. 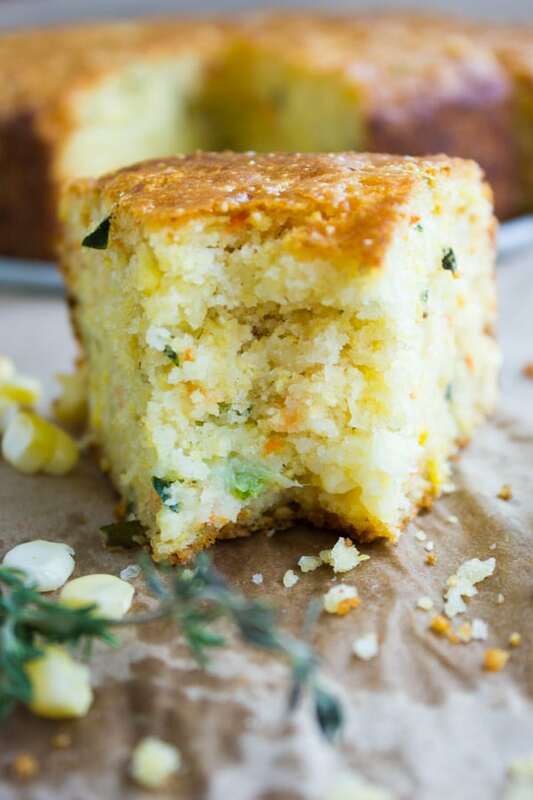 I love the fact that this Cheddar Zucchini Cornbread is super tender – almost crumbly. I love a really nice butter flavor so I use melted butter in this cornbread recipe, but I add a little bit of oil to enhance the softness of the bread. When it comes to flavor—corn corn and more corn!!! No skimping on the corn here! Plenty of fresh corn, every single bite is loaded with fresh corn! And when it comes to sweetness—I prefer my cornbread to be on the sweet side, this is completely optional so feel free to go lighter on the sugar. Now on to the veggies. Zucchini adds a ton of moisture and soft texture to the cornbread while having a super neutral flavor, so it’s a win-win here. Carrots, add a touch of sweetness and texture, again with barely any flavor because I don’t use that much. Some of my other favorite additions to this fabulous cornbread recipe are finely diced sun-dried tomatoes, kale bits, herbs, bits of olives, and even japalenos! Just watch out for the sizes of your veggies. The smaller the better—nothing larger than the size of a corn kernel to be safe and always use them in moderation! When it comes to the flour—I love using a 50:50 ratio or cornmeal and all-purpose flour for this cornbread recipe. With all cornmeal, I find the cornbread tends to lose some of its tender fluffy character—which I love! And when I use all flour, well it’s not cornbread anymore! The type of cornmeal I use is a bit coarse, for extra bite and texture—as long as you don’t use cornstarch—you’re good with any type of cornmeal! This cornbread recipe is so easy, that I can summarize it in one sentence only! Mix dry and wet ingredients separately, then combine, stir in your add-ins and pour into a baking dish! E-A-S-Y! Use coarse cornmeal for best texture and a bit of bite. You can freeze whole or slices of this cheddar zucchini cornbread and re-heat them in an oven, defrost in a microwave or warm up in a toaster. Feel free to add any vegetable (fresh or dried) to the cornbread batter, but practice moderation and make sure nothing is larger than the size of a corn kernel! This bread can be baked in a loaf pan, cast iron pan, a square pan or a sheet pan—just adjust baking times. Pair this cornbread with this Sweet Potato Black Bean Soup or this Cuban Black Beans Chicken with Rice! Take a break from regular cornbread and try this fluffy Cheddar and Zucchini Cornbread recipe. 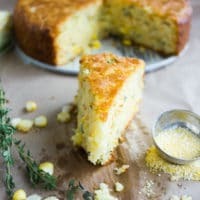 The batter can be whipped up within minutes and once baked, this fluffy, cheesy cornbread is the perfect accompaniment to any bbq, soup or stew! In a medium bowl, whisk the dry ingredients together. In another bowl, whisk the sugar, egg, yogurt (or buttermilk), sugar, butter and oil until well blended. Add in the dry ingredients, all veggies and cheese and then use a spatula fold everything together until the batter looks mixed and blended. It doesn’t have to be smooth and perfect. Pour the batter into a 9 inch round cake pan (lined with parchment) and bake for 50 mins until a toothpick inserted in the centre of the bread comes out clean. Cool for 10 mins, slice and serve. I made this, and it was quite good. I was confused about whether squeezing the water out of the zucchini or not. The recipe did not mention what ro do with the grated zucchini. In the end, I did lightly squeeze out some water. I would squeeze out more liquid next time since the cornbread was too moist/watery on the inside. I used 3 tablespoons of sugar and found it sweweet. Maybe I would use half as much sugar next time around. Besides that, this recipe is a winner. A great way to get my kids to eat their veggies. Thanks! Thanks Coco!! So glad you enjoyed this 🙂 It’s absolutely our favorite too! I usually grate and fold the zucchini right away, but I’ll add a note to squeeze the zucchini if grated ahead of time. Thanks Coco! I love cornbread and this with the additions must be over the top fantastic! I will be making this one! 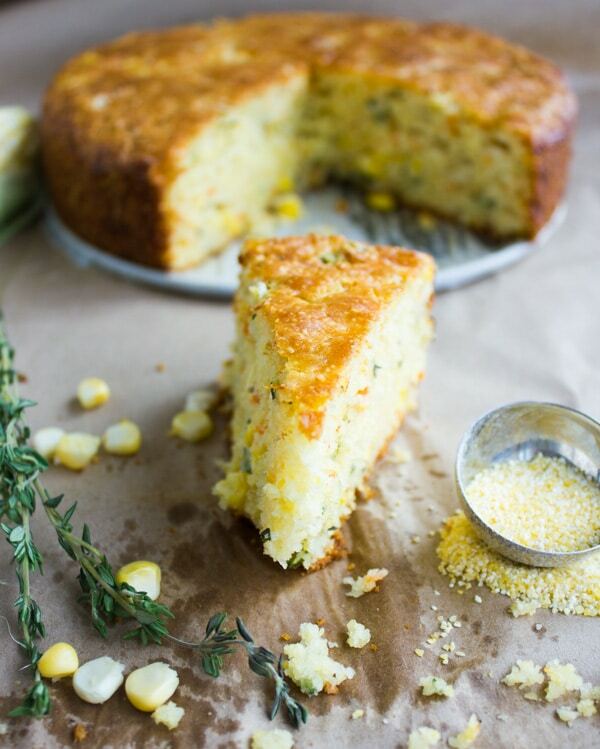 What a soft, airy and fluffy corn bread that is. Love that you added veggies into it – making it so colorful and delicious. Would love to try this one out some time soon. 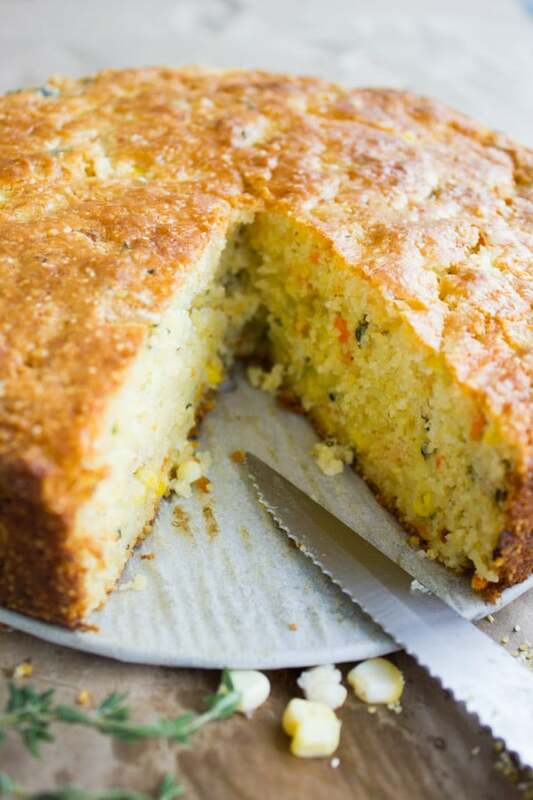 The addition of zucchini makes this cornbread irresistible. This is a must try recipe! Looks soo good! Cornbread is such a great side. I love the cheddar and zucchini addition, and I bet it gives a fantastic texture! Cheddar in cornbread.. omg! Just yummy! That must be perfect. I love the addition of zucchinis too. I must give this a try! Like asap. !